D-Link has started to ship the draft 802.11ac routers it rolled out at January's CES. The first to hit our test bench is its new top-of-line DIR-868L. 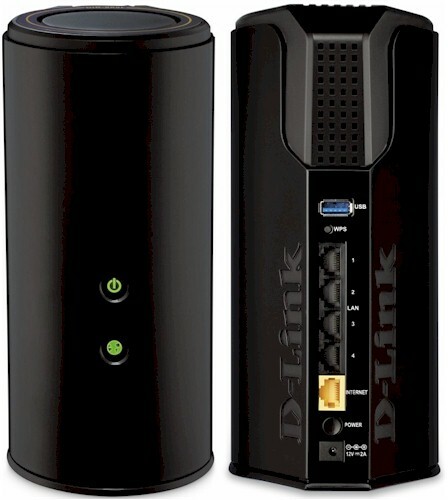 D-Link is banking on its cylindrical form-factor to attract potential buyers, since four of its five new draft 11ac routers come in that shape. The family portrait below shows the 868L as the tallest of the group. As an AC1750 class router, the 868L supports link rates up to 450 Mbps in the 2.4 GHz band and 1300 Mbps in 5 GHz. If you're a fan of blinking lights, you won't like the 868L, or any of the D-Link "AC" line, for that matter. All you get are a power and Internet light on the front, which use color and blinking to indicate, power, boot, WPS and internet connection status. There are no indicators to show either Ethernet or wireless activity or status. As is befitting a top-end router, all the 868L's Ethernet ports are Gigabit. You get only one USB 3.0 port, however, that supports D-Link's Shareport Plus drive and printer sharing feature. The FCC ID docs had lots of pictures, but none clear enough to identify most of the components. So I opened up my sample after testing was done for a look. Unfortunately, D-Link really doesn't want you messing with the innards and has applied silicone goop to all the fasteners and connectors. They even went to the trouble of soldering the RF shields in place! The component side of the radio shown in the photo below holds the 2.4 GHz band radio and main processor. The underside of the board is where the 5 GHz radio sits, on a mini PCIe module. Each radio gets its own three single-band antennas, with most of them on small printed circuit boards positioned around the two halves of the router's cylinder housing. The FCC docs have pictures of each antenna, which are clearly identified as Mgear from Whayu Industrial Co. Even though I couldn't see the actual components, I've put my best guesses into the table below. I've included some more pictures from the FCC ID docs in the gallery that you'll find in the next section. Feel free to make your own guesses!